It turns out Land Rover has been working on a very special version of its Discovery SUV, teaming up with the Red Cross to create a rugged rescue vehicle that slaves to a drone for more versatility when responding to a crisis. Say hello to the noble Project Hero. Created by the Jaguar Land Rover Special Vehicle Operations, Project Hero is an 'advanced communication vehicle', created to support Jaguar Land Rover’s partnership with the International Federation of Red Cross and Red Crescent Societies (IFRC), the world’s largest humanitarian network. This unique Land Rover that will be trialled by their emergency response teams. It is hoped it will help the Red Cross save lives by speeding up response times to disasters. 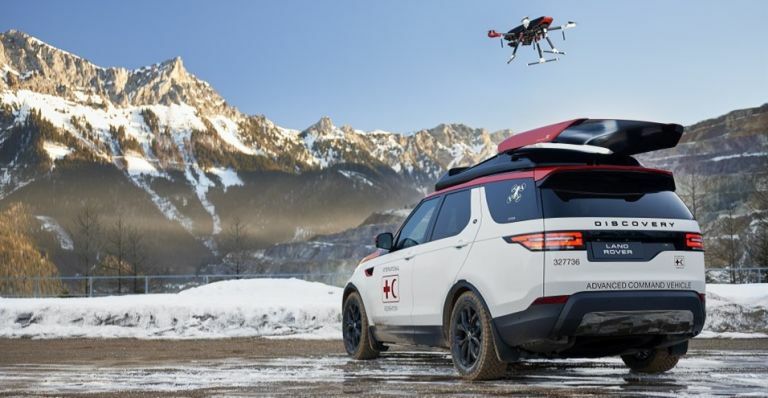 Land Rover has created 120 vehicles to support the Red Cross over the years, but Project Hero is the first to feature a bespoke drone. Said drone also utilises the world's first magnetic retention and self-centring tech, which enables it to land safely on the SUV while its in motion. It's hoped this innovative feature will enable the Red Cross improve communications and cut disaster response times. The Discovery itself features a heavy-duty sliding floor in the rear load space, a segregation panel behind the rear seats for additional equipment mounting points, lots of LEDs to help night vision and more. Fitbit has announced its latest fitness wearable, the Alta HR, which the firm says is the world's slimmest activity tracker with extra built in continuous heart rate tracking via PurePulse. heart rate tech. The Alta HR also comes with automatic exercise recognition, sleep tracking, battery life of up to seven days and smart notifications. You can pre-order your very own Fitbit Alta HR today, with a release date planned for 13 March. The Fitbit App is also getting a new feature, SleepStages. This new utility is powered by PurePulse and utilises heart rate variability to estimate the amount of time you spend in light, deep and REM sleep, as well as time awake each night, to better understand your sleep quality. You can also use Sleep Insights to collate that data and see how you can adjust your sleep patterns for better overall health. Alta HR is available for pre-sale today on Fitbit.com for £129.99 and from 13 March, Alta HR will be available online and in stores, including major retailers such as Amazon.com, Argos, Currys PC World, Shop Direct and John Lewis. There's also a Special Edition for £149.99. The Renault Alpine is back! Alpine revealed its production car the Geneva Motor Show today: the new A110. The A110 has been designed and engineered in Groupe Renault’s Technocentre in Guyancourt and in Renault Sport’s engineering centre in Les Ulis. It will be built at the Alpine factory in Dieppe and deliveries will start late 2017 in Continental Europe. Deliveries in the UK and Japan will start in 2018. The A110 is ultra-light at only 1080kg (excluding options). Its compact size, optimal weight distribution and low centre of gravity are all 'dedicated to agility' says Renault. The A110 is equipped with a new 1.8-litre 4-cylinder turbocharged engine and a 0-60 time of 4.5 seconds. Sanus has just unveiled its new Swiveling TV Base, a table-top TV base that recreates the sleek look and feel of a mounted TV. Designed to be compatible with the newly-announced Sonos home theatre speaker, the Playbase, the Swiveling TV Base provides up to 8 inches of TV height adjustability creating space to fit a Sonos Playbase or Playbar below your TV. The Swiveling TV Base fits TVs 32 to 60 inches and can support up to 27 kg in weight, and its safe and stable base is perfect for furniture with a shallow depth or width. It also features an easy three-step assembly that only needs 20 minutes and a screwdriver. It's available now direct from Sonos.com and will be coming to most AV retailers next month.